↑ "Pot allocations for the Preliminary Draw". FIFA. 27 July 2011. สืบค้นเมื่อ 28 July 2011. ↑ "FIFA 2014 World Cup Tickets on Sale in August 2013". Fifa2014wiki.com. 2 June 2013. สืบค้นเมื่อ 20 June 2013. ↑ "Argentina, Brazil and Colombia want 2014 World Cup". People's Daily. 19 January 2003. สืบค้นเมื่อ 9 October 2011. ↑ "Brazil confirms bid – Colombia withdraws". Fifa.com. สืบค้นเมื่อ 9 October 2011. ↑ "Brazil confirmed as 2014 hosts". FIFA. 30 October 2007. Archived from the original on 31 October 2007. สืบค้นเมื่อ 30 October 2007. ↑ "FIFA's Inspection Report" (PDF). สืบค้นเมื่อ 9 October 2011. ↑ "Sao Paulo dropped for 2014". SBS. 17 June 2010. Archived from the original on 28 June 2010. สืบค้นเมื่อ 17 June 2010. 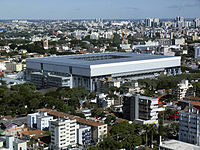 ↑ "Estadio do Maracana - Rio De Janeiro". fifa.com. สืบค้นเมื่อ 2 June 2013. ↑ "Site oficial do Sport Club Internacional - Projeto Gigante Para Sempre". Internacional.com.br. สืบค้นเมื่อ 25 May 2013. ↑ "Key issues addressed at Brasilia meeting". fifa.com. 28 June 2012. ↑ "นัดที่ schedule for 2014 FIFA World Cup™ unveiled". fifa.com. 20 October 2011. ↑ "FIFA Executive Committee approves kick-off times for Brazil 2014". fifa.com. 27 September 2012. ↑ "นัดที่ schedule for 2014 FIFA World Cup™" (PDF). fifa.com. 27 September 2012. ↑ "Match report – Brazil–Croatia" (PDF). FIFA.com. 12 June 2014. สืบค้นเมื่อ 13 June 2014. ↑ "World Cup money pot increased to $576m". reuters.com. สืบค้นเมื่อ 25 April 2014. ↑ Shanahan, Mark; Goldstein, Meredith (10 July 2010). "Gisele picks logo, shops with Tom – The Boston Globe". Boston Globe. Archived from the original on 11 July 2010. สืบค้นเมื่อ 11 July 2010. ↑ "Designer critica logo da Copa 2014: "É uma porcaria" – Terra – Esportes". Terramagazine.terra.com.br. Archived from the original on 12 July 2010. สืบค้นเมื่อ 11 July 2010. ↑ "2014 Ambassadors unveil Official Poster". FIFA.com. 30 January 2013. สืบค้นเมื่อ 28 March 2013. ↑ "2014 Mascot is big in Brazil". ↑ "Fuleco wins name game". Fifa.com. 26 November 2012. สืบค้นเมื่อ 1 December 2012. ↑ 38.0 38.1 "adidas Brazuca – Name of Official Match Ball decided by Brazilian fans". FIFA.com. Fédération Internationale de Football Association. 2 September 2012. สืบค้นเมื่อ 3 September 2012. ↑ "Caxirolas: The Vuvuzelas of 2014 FIFA World Cup in Brazil". Fifa2014wiki.com. สืบค้นเมื่อ 20 June 2013. ↑ "Folha de S.Paulo - Internacional - En - Sports - Caxirola is Banned in Brazil's Games and FIFA Events - 28/05/2013". .folha.uol.com.br. 2013-05-28. สืบค้นเมื่อ 2013-10-21. ↑ "2014 FIFA World Cup BrazilTM Media Rights Licensees" (PDF). FIFA. 7 November 2013. ↑ "FIFA revenue estimated to be 4 billion dollars at the close of the 2014 World Cup". CONMEBOL.com. 17 May 2013. ↑ "International Broadcast Centre to be hosted in Rio de Janeiro". FIFA. 27 May 2011. ↑ "Nerve centre for World Cup TV production opens in Rio". FIFA. 2 June 2014. ↑ เอไอเอสไม่ยอมตกเทรนด์! ให้ดูบอลโลกสดทุกนัดผ่านแอพฯ, ไทยรัฐออนไลน์, 12 มิถุนายน 2557. ↑ ศาล ปค.สูงสุดชี้ 'RS' ชนะไม่ต้องถ่ายบอลโลกทางฟรีทีวี 64 แมตช์, ไทยรัฐออนไลน์, 11 มิถุนายน 2557. ↑ คนไทยเฮ! คสช.จัดให้ดูบอลโลกครบทุกแมตช์ สั่ง กสทช.ถกอาร์เอส, ไทยรัฐออนไลน์, 11 มิถุนายน 2557. ↑ มติ กสทช.ควัก 427 ล้าน ให้อาร์เอสถ่ายบอลโลกออกฟรีทีวี, ไทยรัฐออนไลน์, 12 มิ.ย. 2557. ↑ ช่อง 5-7-8 จับมือถ่ายทอดสดบอลโลก 64 แมตช์, โพสต์ทูเดย์, 12 มิถุนายน 2557. ↑ งานเข้า 'อาร์เอส' ผู้บริโภคจี้ คืนเงินค่ากล่องดูบอลโลก, ไทยรัฐออนไลน์, 12 มิถุนายน 2557. ↑ 'เฮียฮ้อ' ย้ำ-ยินดีจ่ายชดเชยกล่องบอลโลก, ไทยรัฐออนไลน์, 13 มิถุนายน 2557. ↑ "Brazil Named as World Cup 2014 Host". Brazil.homesgofast.com. สืบค้นเมื่อ 9 October 2011. ↑ "Stadium construction work in Brazil viewed by Pléiades". ↑ "Fifa Protected Area". Protectedplanet.net. สืบค้นเมื่อ 20 June 2013.